Big Sky has finally been blessed by mother nature, back to back powder days that leave only feelings of satisfaction. You know it is a good day of skiing when Big Sky local Jed Donnelly pictured below (taken by Brit Barnes) is throwing down back flips off of Big Rock. 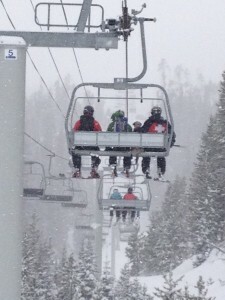 Yesterday we started with a good 6-12 inches of fresh powder that gave some great face shots shown in the image above. Today we woke up to another 7 inches of fresh pow while it consistently kept falling all day. I was still a little weary to wear the new skiis due to last weeks rock population, though halfway through the day my dear roommate brought me up my new skis (K2 Sidekick Rockers – From Bob Ward and Sons) and I felt as if I was gliding down freshly whipped cream on top of a delicious pumpkin pie. There was not one run that didn’t have powder left on each side to dilly dally through. Though I would have to say I was hindered not by the weather, snow or cold but by the lack of strength in my legs. It is time to get seriously in shape so I can keep up with the face shots and mother nature dumping on beautiful Lone Mountain. 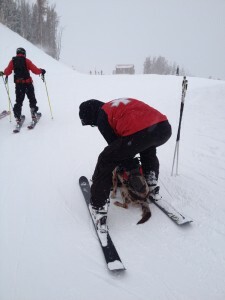 I saw for the first time a dog ride up a chair lift as you can see in the photo above if only I could have seen how it gets down the mountain. On the other side, Moonlight Basin had its second day of the season and tickets only $27!! Where word on the street is was knee deep and one of the better first days to hit the resort. After another predicted couple inches of fresh powder throughout tonight, I am sure I will find myself dipping over on the dark side at Moonlight and believe me. I will be sporting the Sidekick Rockers all. day. long.